Democrat Ralph Northam defeated Republican Ed Gillespie in Virginia on Tuesday, keeping the governorship in the hands of the Democratic Party for another four years. Among those who voted, Gillespie did a good job appealing to his conservative base, getting the solid support of older, more conservative white voters. But liberals and moderates tacked strongly towards Northam, helped by the strong support of women, African Americans, younger voters, and those who disapprove of President Trump. 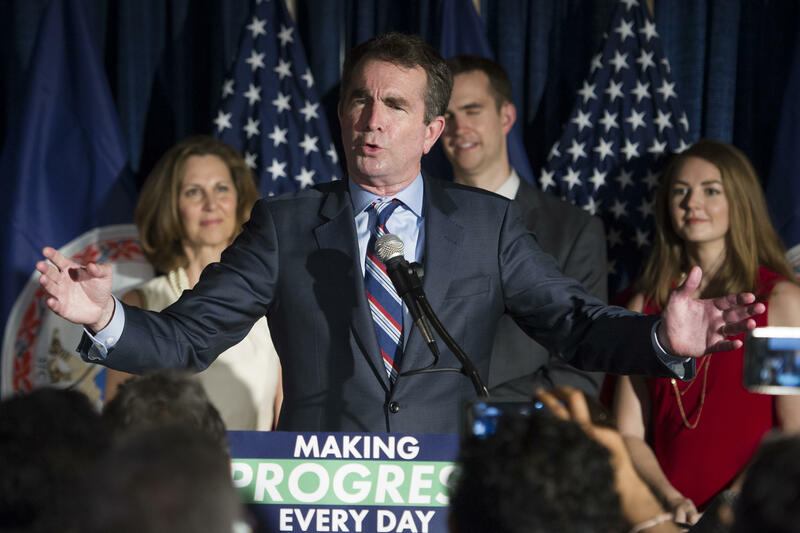 While Gillespie made a strong showing in central and western mountain regions of the state, Northam did far better in the rest of the state – the D.C. suburbs, the Hampton Roads or Tidewater region, and the area around Richmond. Despite pre-election polling that indicated Gillespie might be making inroads on Northam's lead in the polls, exit poll results show a strong shift towards Northam in the last days of the race. Of voters who made up their minds within the last week, six in ten voted for Northam. Gillespie pointedly championed certain touchstone cultural issues in his campaign, though it did not bring about a victory in Virginia. While most voters agreed with Gillespie that monuments to Confederate leaders on government property should remain in place – a fourth who did so nevertheless voted for Northam. And while voters who chose immigration as their most important issue voted for Gillespie, they made up just 12 percent of voters. Instead, the most important issue to voters was health care, and these voters chose Northam over Gillespie by a margin of 55 percentage points. Both candidates sewed up the support of their own partisans -- each getting more than nine in ten votes from members of their own parties – and Gillespie held a slim three-point advantage among independents. But Democrats made up 41 percent of the Virginia electorate – a four-point increase from 2013 and ten points more than the Republican share of the vote – which more than offset Gillespie's slight edge among independents. Overall, six in 10 Virginia voters said they had an unfavorable view of the Republican Party, while just over half said they viewed the Democratic Party favorably. Negative views of the Republican Party nearly matched the job approval of President Trump: nearly six in ten Virginia voters said they disapproved of the job Donald Trump was doing as President. And while half said that Mr. Trump made no difference in their vote, among the rest, twice as many cast their vote to express opposition to the president as did so to show support. The Democratic Party's rise in the share of the vote accompanied an overall left-leaning shift in the electorate from four years ago. Twenty-seven percent of voters in Virginia described themselves a liberal – a seven-point increase from 2013 – while the percentage of conservatives dipped five points, from 36 percent in 2013 to 31 percent this year. Moderates – who made up the largest slice ideologically at 42 percent of the vote – chose Northam by nearly two to one. Men were divided between the two candidates, but the Democratic vote share among women rose ten points – from 51 percent in 2013 to 61 percent today. The relative turnout among younger voters remained constant, but they embraced the Democratic candidate in far greater percentages than they did four years ago. Mr. Northam enjoyed a 39-point lead among voters under 30; a surge of 34 points from the slim five-point lead Democrat Terry McAuliffe enjoyed in 2013. African American turnout – critical for any Democratic win in the South – remained strong as well. Black voters made up a fifth of the electorate, and nearly nine in ten African Americans voted Democratic, continuing a pattern that has held for the last three statewide elections.